Optimmune There is 1 product. Optimmune eye ointment for dogs contains Cyclosporin A as its active ingredient. Optimmune is a prescription only medicine, usually prescribed for dogs that are suffering from a condition known as dry eye or keratoconjunctivitis sicca.? Optimmune works by suppressing the ability of the immune system to function within the eye. This specifically reduces the function of T lymphocytes and the immune-mediated destruction of the tear gland. What is Optimmune used for? Optimmune is used for the treatment of chronic, recurrent conjunctivitis resulting from autoimmune disease of the eye. Optimmune is indicated for the therapeutic treatment of Keratoconjunctivitis sicca (KCS, ‘dry eye’) and chronic superficial keratitis (‘pannus’) in the dog. 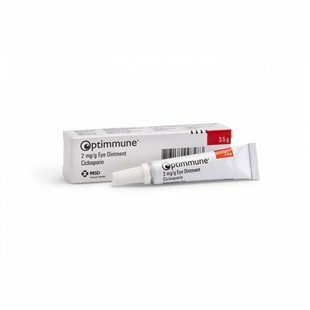 Optimmune be used to augment topical corticosteroids or as a substitute for corticosteroids when these are contraindicated by corneal ulceration. What is Dry Eye or Keratoconjunctivitis Sicca (KCS)? Dry eye or KCS occurs when dogs are unable to produce the watery, aqueous layer that makes up part of the tear film. This results in the cornea (at the front of the eye) becoming dry and inflamed and can even lead to the development of corneal ulcers. Often, animals that are suffering from dry eye will have dull, red eyes with a thick, mucous discharge forming at the corner of the eye. In severe cases, if left untreated, affected animals may lose some or all of their vision. Dry eye is thought to affect 1 in every 22 dogs in the UK. There are several different causes of dry eye, however the most common cause is thought to be immune-mediated destruction of the tear gland. This occurs when your dog's immune system changes and starts to recognise the tear-producing cells as being foreign. Optimmune contains cyclosporin (an immunosuppressive drug) that reduces the immune-mediated destruction of tear glands, allowing your dog to naturally produce the aqueous component of the tear film. This is essential in keeping the eye lubricated and protected from infection and inflammation. Which Breeds Are Most Susceptible to Dry Eye? How Should Optimmune be used? You should always follow the advice of your Vet when using Optimmune. Unfortunately, dry eye is often a life-long condition that cannot be cured and requires continual medication. It is important to continue with optimmune unless told otherwise by your vet, even if your dog's eyes appear to have improved. Generally, most dogs are initially started on twice daily treatment and around 5mm of optimmune paste (about the size of a grain of rice) is required. Gloves should be worn when handling this product. Increased tear production is expected within 10 days of treatment, although maximal levels may not be reached until 6 weeks following treatment. Your Vet may also prescribe other drugs such as steroids for their anti-inflammatory effects, and antibiotics to clear up infections. Artificial tears may also be recommended to make the eye feel more comfortable. None of these treatments will however, treat the underlying cause which is the destruction of tear glands by the immune system. Optimmune is the only product that can achieve this goal. The condition commonly known as dry eye in dogs is more properly known by the veterinary term “Keratoconjunctivitis sicca” or KCS, and occurs when the eyes of the dog do not produce enough natural lubrication in the form of tears. Left untreated, dry eye can lead to permanent damage and scarring to the tissue of the eyes, and even potentially blindness. In this article, we will look at dry eye in dogs in more detail, including why it occurs, and what can be done to manage the condition and preserve your dog’s vision. Lubrication is vital to ensure the healthy functioning of your dog’s eyes, and the eyes should always appear to be clear, moist and bright. The tear ducts, a type of glands at the sides of the eyes, are responsible for producing sufficient lubrication to keep the eyes healthy, and this lubrication is distributed across the surface of the eyes when your dog blinks. Blinking helps to spread a protective layer of lubrication over the eyeball, which keeps the inside of the eyelid and the eyeball itself healthy. Lubrication also helps to wash foreign bodies out of the eyes, provide essential nutrients to the cornea, and help to prevent bacterial infections of the eyes. In dogs that suffer from dry eye or KCS, the tear ducts do not produce enough lubrication on their own to efficiently keep the eyes moist and healthy, which can lead to a range of problems. While the reasons for dry eye are not fully understood, it is thought that dry eye is an autoimmune condition, in which the dog’s own body treats the tear ducts as an invader and attempts to limit or destroy their normal functionality. Exactly how severe the presentation of dry eye is in any given dog will vary, but if left untreated, dry eye can lead to progressive damage to the tear ducts themselves, to the point that they may ultimately stop producing lubrication entirely. What are the symptoms of dry eye in dogs? Persistent or recurrent eye infections with noticeable redness of the eyes. A discharge from the eyes that is white or yellowish rather than clear. Ulcers on the surface of the eyes. Squinting, wincing or other signs of discomfort. Persistently scratching or rubbing at the eyes. It is important to note that during the early stages of the development of the condition, while any or all of the above symptoms may be observed, the eyes may not actually appear to be particularly dry. In order to get a formal diagnosis of dry eye, you will need to take your dog along to the vet for them to perform a Schirmer tear test, which involves using a strip of absorbent paper to measure the amount of fluid gathered under the lower eyelid of the dog in one minute. From this, your vet will be able to determine the volume of tears that your dog produces. A fluid level of 20 or above indicates normal tear production, while a level of 15 or lower shows a potential shortage of tears. A level of 10 or below indicates insufficient production of lubrication from the tear ducts, and so, a definitive diagnosis of dry eye. Dry eye is a lifelong condition that cannot usually be completely corrected, and so treatment of dry eye in the dog depends on ongoing medication or treatments to generate additional tear production, or lubricate the eyes. Medication such as Optimmune, an immune-suppressant medication that limits the body’s negative immune response to the tear ducts, and allows for the natural production of lubrication from the eyes. Surface treatment of the eyes with an artificial tear solution such as Lacri-lube or Viscotears, which provide lubrication for the surface of the eyes without directly affecting the eye’s natural tear production. However, these products need to be applied directly to the eyes several times a day to prove effective, which may not be practical for all dog owners. Antibiotic or steroid medications to help with some of the secondary complications of dry eye, including infections and damage to the eye tissue. In some cases, a veterinary ophthalmic specialist may be able to operate on the eyes of your dog to divert some of the salivary gland flow to the eyes, in order to compensate for the underproduction of the tear ducts. However, the surgical option is not appropriate for all dogs, and may not fully resolve the condition.